You didn’t think a sewing machine could take your embroidery skills a notch higher, did you? Most sewing aficionados thought so, too, until the appearance of the Brother pe770 embroidery machine, a user-friendly, easy-to-use, versatile piece of sewing wonder. With the numerous built-in features of this model, you can stitch designs for home décor, bags, and jackets, not to mention monograms, appliqués, and quilts. Take a look at some of these features and find out why it is often considered the best embroidery-only machine available on the market today. LCD display screen has back lighting for the clearest visibility to design and edit your options before you start stitching them. A 5” by 7” sewing area to give you ample space for your larger lettering and designs or their combinations with less of the re-hooping required. With a plethora of 136 various embroidery designs and six lettering types of fonts including floral, quilt patterns, and exquisite scroll work. Built-in designs also include 12 of the most beautiful border styles and ten of the most professional-looking frame shapes. Extensive design editing capability that enables you to rotate, decrease, mirror-image, and increase design sizes. Easy and fast threading of bobbin and top thread. With an automatic thread cutter for precision in thread trimming and consistent stitching. A virtual cache of unlimited options for designs from its built-in memory. With a built-in card slot for designs which you have saved in your memory card. Import an endless number of designs from embroidery websites straight to the USB memory stick using the built-in USB port. Store your customized, edited or purchased designs to the same built-in memory for your future use. Built-in embroidery tutorials include “how to” topics such as threading the machine, insertion of embroidery arm, etc. Dimensions: 16.77” (length) x 21.26” (width) x 17.28” (height). Compatible media: memory stick and memory card (both require separate purchases). Carrying case type: dust cover. Warranty: 25 years (limited) and free lifetime phone support. Accessories: bobbins, screw drivers, seam ripper, scissors, needle set, spool caps, spool net, cleaning brush, reference guide, accessory bag, and user’s manual (bilingual in English and Spanish). Other inclusions: one 5” x 7” embroidery hoop. LCD size: 2.7” (horizontal) x 1.4” (vertical). With its wide array of features, this machine is an excellent choice for anyone who needs an embroidery machine. You will also be happy to know that it is budget friendly as well. This computerized embroidery machine has plenty of built-in designs (136 of them), including pattern combinations for 120 frames, and six kinds of lettering fonts. With the PE770 you can edit various designs as well as combine them in unique creations of entirely new designs. You can also use the built-in USB port to downloaded designs from the internet or from ibroidery.com. Bobbin winding with this Brother embroidery machine is easy and the touch screen of the LCD display adds even more convenience to your embroidery experience. With variable speeds to match your desired pace, its greatest features are its bigger hoop size and the special card slot that allows you accessibility to an unlimited number of embroidery designs exclusive to Brother. 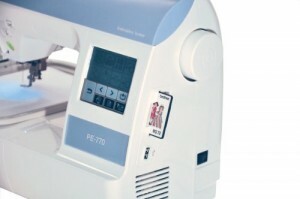 The PE770 is perfect for the home embroiderer who wants a versatile, dependable, and high performing machine fully dedicated to embroidery with which to grow with. The fact that the PE770 was a recipient of the Consumers’ Digest Best Buy award also means that it is a highly recommended product for consumers because it has value for money. Its 25-year warranty and its phone support for the product’s lifespan free of charge also add up to the viability of the PE770 for customers who may be investing in it for a home-based business. And with its 136 designs and a nearly limitless number of other designs which can be downloaded and saved on its memory card, aspiring entrepreneurs appreciate these two features. Some customers have reported a little difficulty when slightly tightening the bobbin but it has to be noted that this particular model is an embroidery machine, not a sewing machine, and would therefore not have the basic functionality of one. Although most customers found this product reasonably priced for its class, others may find it a tad bit more expensive for a machine that is exclusive and limited to embroidery. Others experienced tangling of both the bobbin and the thread several times while others reported some incidents of jamming. If your main requirements for your sewing projects are numerous designs, patterns, appliqués, and the like, then this computerized embroidery machine is most suitable for you. For the number of features that this particular Brother model has, the price is well worth it and should be considered as a particularly practical investment. 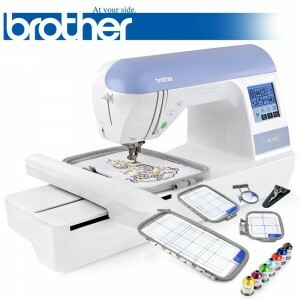 If your embroidery requirements are minimal compared to those of your sewing needs such as buttonholing or seam stitching, what will be ideal for you is a multi-purpose sewing machine with some embroidery functionalities like the Brother se400 (www.grandmalikestosew.com/brother-se400-sewing-machine-review). For those who would like one of the best embroidery machines you can buy today without breaking the back, then the Brother PE770 is definitely for you . Go here if you want to see more of the other Brother models, go to this page.